In this NEW, highly practical seminar, award-winning and published teacher librarian, Tricia Kuon, will share how to revitalize your library space and program, creating an inviting, dynamic atmosphere and environment where students, teachers and administrators will want to return again and again. Tricia will provide numerous cost-effective ideas to help you maximize your time and resources while transforming your library space. You’ll learn how to better collaborate and communicate while marketing your library in such a way to create advocates and make your library the hub of the school. You will gain proven and fresh ways to create a welcoming, user-centered space that encourages the use of cutting-edge technologies and practices designed to expand students’ knowledge base and allow them to create new knowledge to share with the school and community. Join Tricia for an inspiring day filled with strategies, resources and valuable tips to strengthen and enhance your library program. Librarians change lives! I have experienced the truth of this statement beginning with my own life being changed through the power of reading. When I was a child, the library was where we went to find books, check them out, read quietly for a while and then go back to class. Times sure have changed! Librarians of the 21st century are book and technology experts who collaborate and communicate with staff members regularly while running a library and technology center that features cutting-edge technologies, the greatest books available, and a makerspace that aligns with the most amazing, informative, and concise lessons ever designed. 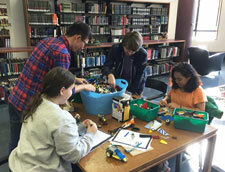 Librarians’ roles have transitioned over time as the library itself has gone from book storage and retrieval location to a full-on Learning Commons with spaces for lessons, technology application and use, action activities like puppet shows and makerspaces, and spaces for meeting, collaborating and communicating. Libraries are indispensable and so are librarians! This seminar will focus on the many ways that librarians can and should embrace the amazing new shift in the library from extremely quiet storage centers of information and retrieval to dynamic, busy centers of storage and knowledge creation. In this seminar, I hope to do some heavy lifting and provide a look at how old ideas like storytelling are being used in new ways and how new ideas like coding, virtual reality and data mining are being used in libraries to expand horizons and make libraries increasingly indispensable and exciting. I hope you will join us for a fun and informative day! P.S. This seminar will focus on innovative, cutting-edge strategies for increasing the impact and effectiveness of your school library program. This seminar provides a wonderful opportunity for participants to meet and share ideas with other educators interested in enhancing their school library programs. Tricia Kuon will be available at the seminar for consultation regarding your questions and the unique needs of your own school library program.